DSF is proud to re-release this historic documentary, produced during the mid‐1980s. 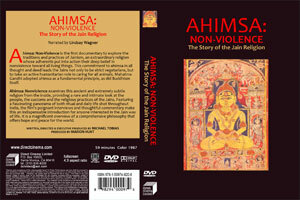 Ahimsa (which means non-violence or non-interference in Sanskrit) was the first major documentary to explore the spiritual/ecological world of the Jains. It premiered on Public Broadcasting throughout the U.S. in 1987 on Christmas Day. Subsequently, it was viewed in many other countries, at festivals and museums throughout the world, but has been unavailable for many years, until now. Produced by Ms. Marion Hunt, and released as a DVD with Direct Cinema Ltd., and the kind collaborative assistance of Rocky Mountain PBS (formerly KRMA-Channel 6/PBS‐Denver). Dancing Star Foundation wishes to convey a Special thanks to Ms. Donna Sanford, Director of Programming and Production at Rocky Mountain Public Television, and Mitchell Block, head of Direct Cinema, Ltd.